Entering Dead Man's Farm entails known and unanticipated risks that could result in physical or emotional injury. Risks may include, among other things, slipping, falling, collision with fixed objects or participants, bruises, sprains, twists, breaks, or seizures. understand that such risks cannot be eliminated with out jeopardizing the essential qualities of this activity. By purchasing this ticket, it is expressly understood that you have been made aware of the risks and agree to assume all the risks associated with this activity. Your participation is purely voluntary and you elect to participate in spite of the risks. By entering our location you agree to give Dead Man's Farm LLC permission to take photographs, videos and audio recordings of you at our location to be used for promotional print and online marketing and advertising, including posting on social networks such as Facebook, Youtube, Instagram, Twitter, and other Internet promotional sites. Dead Man's Farm LLC and it's staff are not responsible for any vehicle or contents in the event of theft, damage, or any other situation involving your personal property. Park at your own risk and be sure to secure, or keep out from plain view, any items that may be of value. Dead Man's Farm LLC and its staff are not responsible for any damage to clothes or personal items. 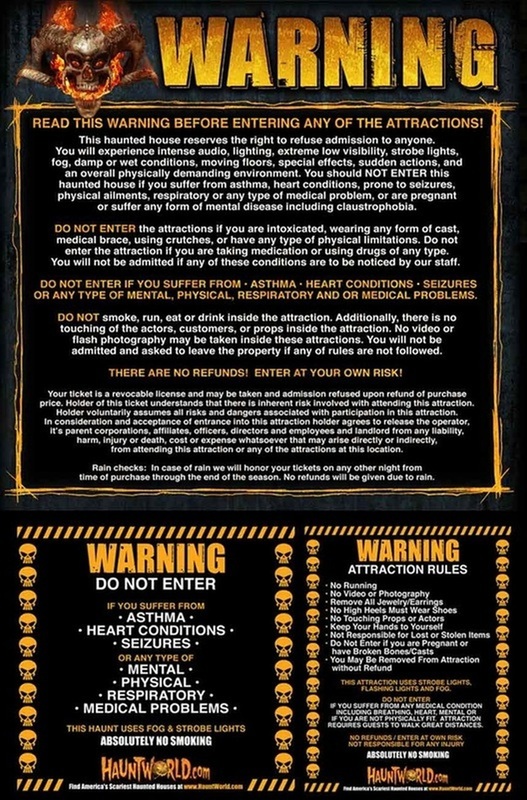 Enter at your own risk. This is our ONLY website, we can NOT be responsible for any misinformation, discount ticket offers or incorrect dates or terms that may be found on other sites. No ownership or direct affiliation with Deep Well Farm or Zombie Hunters Paintball. -Dead Man's Farm LLC is NOT a hay ride or pumpkin patch or a corn maze. COMMERCIAL PHOTOGRAPHS, VIDEO, AND RECORDINGS. -All Commercial use of any film, digital, and/or sound recordings in respect to Dead Man's Farm LLC, it's actors, performers, guests, and/or staff is strictly prohibited without the express written consent of Dead Man's Farm LLC. All materials contained on this website are protected by United States Copyright law and cannot be reproduced, distributed, transmitted, manipulated, displayed, published, or broadcast without written permission of Dead Man's Farm LLC. No ownership or direct affiliation with Deep Well Farm or Zombie Hunters Paintball. WARNING! EVENT MAY BE TOO INTENSE FOR SOME AND IS NOT RECOMMENDED FOR CHILDREN UNDER THE AGE OF 12.